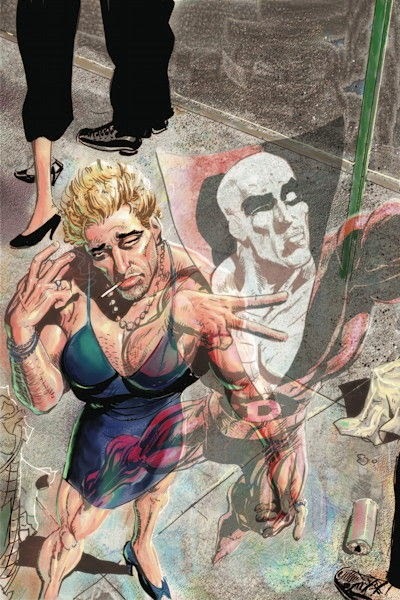 Many years ago Deadman's life came crashing to an end when he ate a potato made of concrete. Now for more information pertaining to his eventful demise, please check out this adventure Created by: J. M. DeMatteis, Andres Guinaldo; and Published by DC Comics, in August, 2014. To QUOTE Lady Gaga: 'I am my own sanctuary and I can be reborn as many times as I choose throughout my life'. 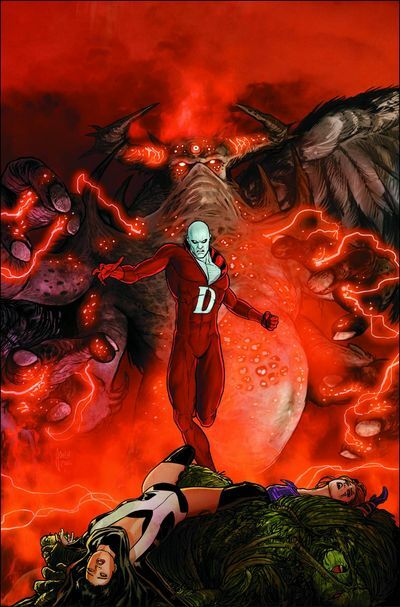 When we last visited our heroes of Justice League Dark in Nada Parbat, Deadman was still alive yet in prison, whereas his team-mates were also alive yet in prison. But don't worry though, folks. With some help from Brahma Das and Swamp Thing, together -- yet apart -- they eventually join forces, and try their utmost to stop the evil God who turned this mystical kingdom into sh*t.
You know. What's his name! That 'Pantheon' plonka. The top man around here until yadda-yadda-yadda, snore-snore-snore, the end, huzzah! What's more, a lot of other mystical stuff happens too. Like Johnny speaking in English for instance. 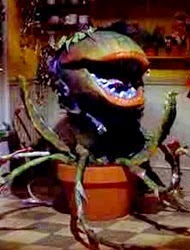 Or Swampy transforming himself into 'Audrey 2' from 'Little Shop of Horrors'. Oh, sorry! Was that reference too obscure for you, dear reader? Damn. My bad. That always happens' to me when DC decides to F*CK UP a characters origins. Oh, dear. Is there anything nice I can actually say about this issue of 'Justice League Dark'? Well, I suppose I can try, can't I? Because I did love that earthy looking cover provided by my mate, Mikel Janin. Plus I best mention enjoying JM's colorful characterization of Brahma Das, as well as the way he interacted with Deadman throughout the majority of this adventure. But apart from that, though, well, yes and no. Even though on a cosmetic and character based level it wasn't that bad a read -- keep it up guys -- as push comes to shove everything else pertaining to this tale never quite floated my boat. The way the two divergent factions of the team came together was hardly worth the time or effort keeping them apart. And as for how this tale ended -- ouch -- that came out of nowhere, didn't it? Shame. What a bloody shame. Why the hell are DC changing Deadman's origin's for? Well. Let's face it. Does it need changing? No it doesn't. Back in the day Boston's beginnings was one of the most original story-lines to ever come out of this publishing house, because it had that really captivating quality about it that was intriguing and expansive to behold. Now though -- ouch -- what can I say about this new take with that Brahma Das fellow? Nothing much I suppose. Presently he seems like a pretty OK-ish chap. But that's about it really. Nothing more. Nothing less. And to a certain extant I can say exactly the same thing about this new-ish version of Nada Parbat as well. It seems OK on the surface, and will probably need a bit of time to take hold in this not so New 52 universe. Again. It's a shame, eh? Why fix something that isn't broken? As I've already stated this piece of trivia in my summary up above, I best compare this comic book to 'Audrey 2' from 'Little Shop of Horrors'. Well, Swampy does look slightly like this fowl-feeling-fauna, doesn't he? Plus they're both rather funky to follow. At the very end of this tale something suddenly happens to Nada Parabat. So just for fun, can you guess what it is out of the following eight scenarios? The whole place it purchased by Walmart and turned into a massive shopping-mall. Shazam unexpectedly falls out of the sky and blows up the whole area. A group of renegade monkeys run onto the scene and begin a planet of their own. Two hundred Elvis impersonators sing 'You Are Always On My Mind' in Chinese. After a huge explosion everything is put back to what it once was. Zzzzzzzzzz. Deadman and Zee build a small hotel made out of Swamp Thing and Johnny's ego. The Chevron Corporation pull up in their vans and quarantine this location for untapped oil.